When you are looking for quality child care in the Huntington area of Long Island, Rainbow Chimes Early Childhood Education and Care Center should be at the top of your list. We offer high-quality early education programs using the High Scope Curriculum. This curriculum emphasizes a child’s role as an active learner. We serve children from 2 months to 10 years. For infants, we offer care starting at age 2 months. 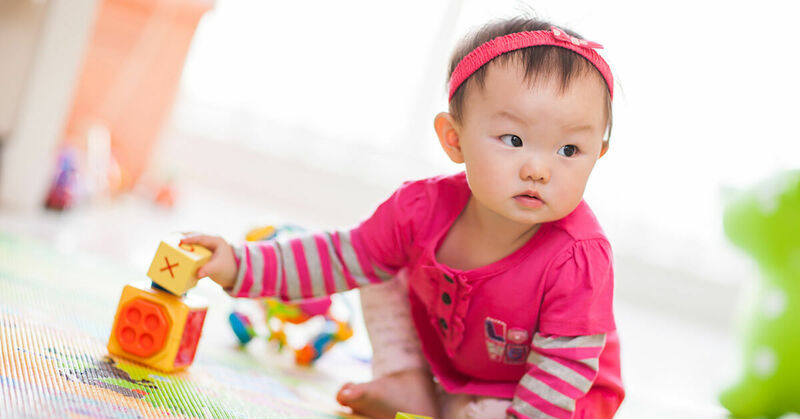 Even from their earliest experiences, babies learn about their world be interacting with it. At this early, sensorimotor stage (according to Jean Piaget) a baby uses their senses and growing motor skills to learn about their world. All babies are born with certain reflexes and this is their first method of learning. We help learn and explore by interacting with them appropriately, holding them while they are being bottle fed for example, and providing age appropriate toys. When the weather permits, we take them outside in special buggies. We know that parents want to be involved with their infants lives and so we use technology to communicate with parents about their child’s unique schedule, their eating patterns and even send photos to desktops and mobile devices. You can feel confident that you child is be3ing well cared for on a physical as well as psychological and emotional levels when they are at Rainbow Chimes. All our infant/toddler instructors have degrees in Early Childhood Education. And we are dedicated to providing the best early education for all children. Call today to schedule a visit.